Today I used this new free online reading assessment tool. You sign up, put in your students names and all they do to log in is write the teachers name and choose themselves from the list. I would prefer that each student has a login like in Raz Kids (the teacher generates it) so that student can only access their own page. Perhaps in the future? Pick levels and readings - Literably supports grade levels, guided reading levels and LEXILE® Measures. Choose readings or let Literably choose them for you. Assess one or dozens of students - Each student reads aloud to Literably. You can rotate students through a station or test the whole class at once! Get hassle-free data and reports - For each reading, Literably generates an audio recording, a running record, words correct per minute, percentage accuracy and a leveling recommendation (up or down). It also plots student growth over time. Share data - Print or email to share with students, parents and administrators. Here is a short screencast that I made showing the results from Literably. I asked my son to read last night so that I would have an authentic result to share with you all. As you can see the site annotates the text with any mis-reading or pronunciation mistakes. You can hear the original reading by the child so that you can compare it with the results. Today I took a further step and emailed all of my students their results. I asked them to listen to their recordings and the look at the mistakes. Next I will ask them to read the same reading to see if they can improve their score. This will turn this diagnostic tool into a teaching tool. 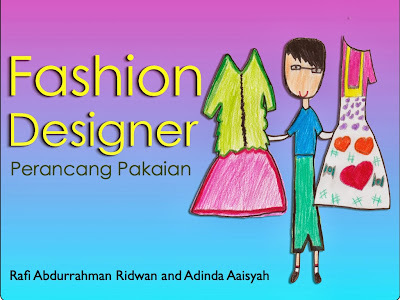 I am very proud to have my work posted on the Book Creator website. I have three posts in their blog and have been featured in the Education section as well. What happens when you give creative tools to students and allow them to use their own voice? 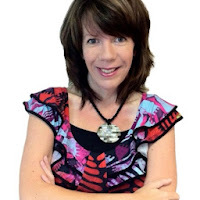 Jane Ross is an Apple Distinguished Educator and Technology Coach teaching in Asia. 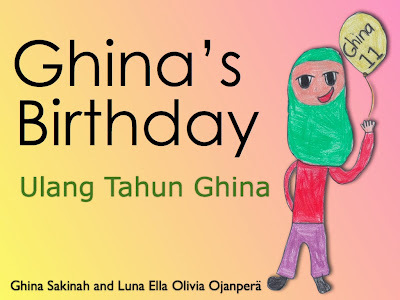 In 2012 her school, Sinarmas World Academy, decided to embark on a huge publishing project with the aim of publishing 1,000 books in 7 months! This is the story of her students who went on to become published authors with an international audience. My students are each creating a resource that will be available for download across the world. This is authentic learning at its best. My students have a voice. The books that they are creating are giving them a platform to share their work as a finished product. Writing a book is a very different experience to writing on a website or blog. The book is created as a finished product – it becomes an artefact. Writing a book is a fantastic way to make connections in learning and to reflect on learning. 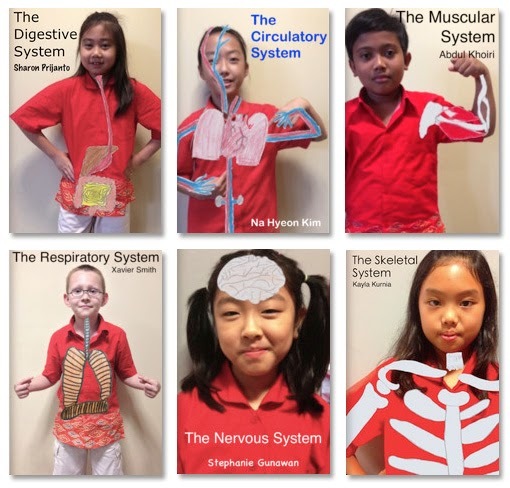 Each book in my class has been research-based, includes student-created photos, videos, voice recordings and hand-drawn diagrams. The students have learned about cover design, contents page, how to cite information, layout, font, color, relating pictures to text, creating accurate diagrams and how to put it all into a sequence from the beginning to the end of the book. Each student wrote an explanation about a body system and an information report about a focus part of that body system. To go beyond the text, each student had to draw accurate diagrams to accompany their words. My students are 9 years old but I have taught them a simple referencing style with author, year, book title and page number. This was all collated into an ebook using Book Creator for iPad. They also had to create a movie showing an experiment or demonstration that linked to the body system. As well as this they also took their iPads home and took pictures showing how they can actively keep their body system healthy at home. iPads are so great for this. They are easy to use, capture is so immediate and creating dynamic digital interactivity is very easy to do. It changes the whole way we think about learning. So much of education is text based. I love being able to create opportunities for my students to communicate visually. Recently my class had the opportunity to share their books with a younger class. They were so excited to show their books and talk about the body system that they had researched. Each of these books averages at about 35 pages. It’s become a very big task but a very interesting one. I have read the books many, many times to check for spelling, grammar, factual text, that the facts have been reported correctly and information cited properly. I also have to check the quality of the images (not blurry and connects well to the text), that the font is consistent and easy to read. I also check that the layout is balanced. Even that a good contrast between text and page color has been achieved. As these children are under 13 years old, I invite the parents to come to school where I help them to set up the iTunes and iTunes Connect accounts. This means that the parent becomes the publisher and has full control over the book accounts. After about 2 months I took a look at the download stats for 6 students who had recently published to the Apple iBookstore. We were thrilled to discover on the US iBookstore that all six of my published students are currently in the top 150 downloads for children’s non-fiction books. It was quite awe inspiring to project this screen up in the classroom. We decided to take a small ‘world tour’ of different iBookstores to see just how many countries are featuring these books. We learned that in the US, Australia, Canada, the UK and the Netherlands, some or even all of these students are ranked in the top 200 downloads. That’s quite an achievement for a group of 9 year old students. What an exciting time to be a student!! I have been publishing stories with children for many years. In the past I helped my students to build their stories using Keynote on the Macbook. Nowadays I prefer to work directly on an iPad. In this post I will cover the basics of working with children to create authentic stories based on personal experiences. I have developed a model that works with children from International schools to children from National schools in remote areas. My own children love telling stories. My youngest son tells stories with style. He often tells stories about his own experiences in the third person. “John did this ... and then John said that.” He tells his stories with a mix between recounting what he did and what he said. When your book is on the iBookstore - you want it to stand out from the others. This will encourage people to click on it. This will help your book to be 'seen' and not fade into the many other books on display. To create a stand-out cover, use contrast and white space properly. I apply the same principles that I would use in painting. 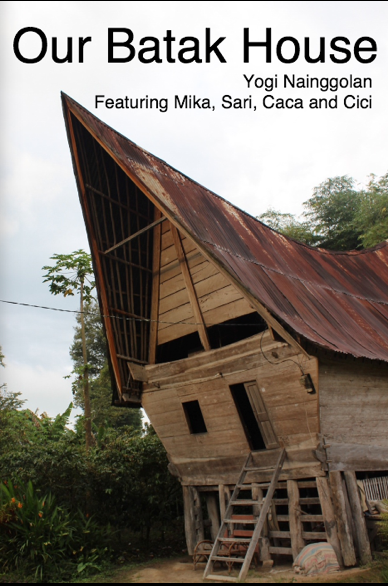 Look at the strong diagonal created by the slope of the roof of this house. It leads your eye from the title down the middle of the cover - magic! Be wise when helping your students choose their book cover. The model I use stays the same but it is important to realize that the teacher must build a relationship with the child. This is particularly important when working with students that are not in your regular classes as you need to take time to get to know your learner. I always start with the ‘why’ when working on developing a story. If the child can articulate why the story needs to be told, it will be much easier for them to create it. 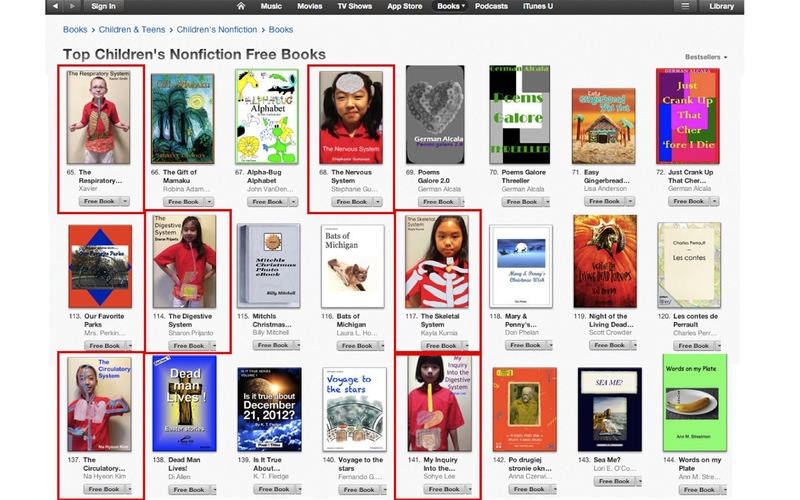 You will need an iPad for creating the book and Macbook to create the publishing package to send it to the iBookstore. You cannot directly send the book from the iPad. Children are spontaneous in the telling of their own stories. There is a real excitement there when sharing stories based on personal experiences. I believe that it’s because children can make deep connections to their stories, even to the point where they often want to reenact parts of the story for you. My approach is to encourage children to write about personal experiences that can be captured using an iPad. The iPad is perfect for capturing stories with it’s large screen and tactile surface. Children can quickly build their story and stay connected to it as it builds under their fingers. It could be a story about playing, catching a butterfly or even caring for a pet. It does need to be something that we can have access to so that the activity can be recorded as a series of photographs. Once the main idea for the story has been decided upon, the sequence of events needs to be listed so that the children know what photographs are to be taken. I like to encourage the author to write down as brief notes which can be easily referred to. Don’t ask the child to write the whole story before they take the photos. This can lead to issues later such as the photos don’t match with the story. Just write down a rough idea with a sequence of events. Try to think of the story more as a storyboard and let the dialogue come later. Writing down these notes on paper provides less distraction than using the iPad. This is important with children from remote areas. Keep it simple and don’t worry if they haven’t got the idea for a complete story. This can be developed later. I encourage the children to work backwards by writing the ending first. The ending can often be harder to find than the beginning. The content of a story book is made up of a beginning, a middle and an ending. I always follow this format as it is what most children are familiar with. My model goes a little beyond that so it includes two more sections. There is an ‘About the Author’ section and a ‘Behind the Story’ section. 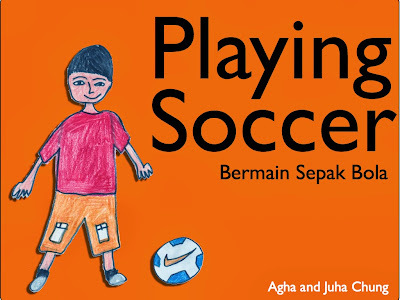 This is to give more information to the reader so that this book can have more meaning for an international audience. It is essential that students are made aware that their books will be read by people from all over the world and that they need to tell their story in a way that everyone will understand. The 'About the Author' section of the book is very important. How else will people realize that the author is a child? 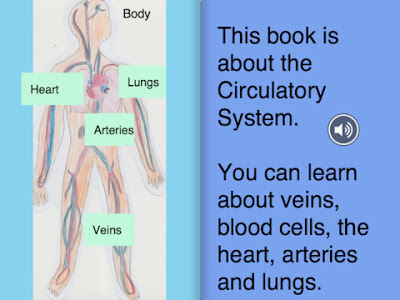 Using Book Creator it is very easy to create a book that looks very professional. 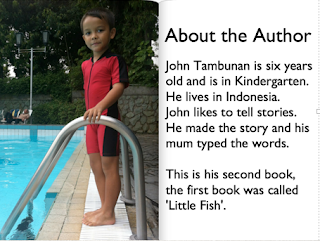 If I didn't include an 'About the Author' section, people may not realize that the creator of the book is only 7 or 8 .... or even 5! I also like to include a 'Behind the Story' section for project books such as the Backpack Classroom series and my current eBook project with deaf students. I want the readers to understand some of the background information behind each book. This is important so that the reader can make connections. It helps our readers to empathize with the story and what it represents. 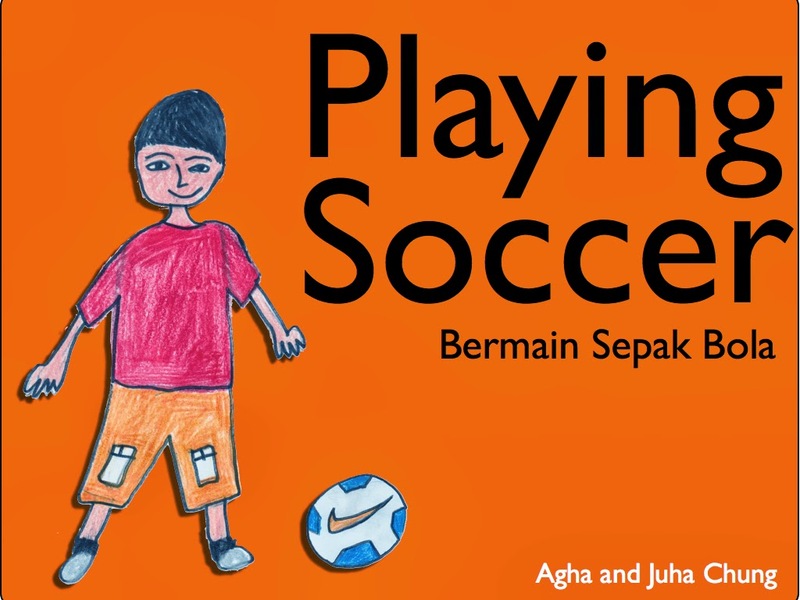 Take a look at this book from the Backpack Classroom project. My Backpack Classroom books are being downloaded all over the world. Many children from the US are downloading these books and would not realize that the authors come from very modest means. The authors are rice famers children and don't have access to the same types of resources or even the same level of education that a child in the US has. Creating a 'Behind the Story' section can help your readers to understand these things better. In my next post I will cover the process of creating the story and capturing the images for the book. My current class is working on a project to author eBooks with the deaf school here in Jakarta. We have already had two face to face meetings. In the first meeting the Grade 4 from SWA travelled to the Santi Rama Deaf school. We paired up each student and got down to work. As preparation, both Grade 4 classes learned how to do some simple ASL - American Sign Language. We learned to perform the song Fireflies in ASL. It was interesting to learn the song and quite fun too! We learned during our first meeting with the deaf school that Indonesia has it's own sign language. Luckily it is really similar to ASL so we were able to use a lot of what we had learned in preparation. We found that being able to spell out words came in very handy!! My first sentence in sign language was 'What's your name?' and 'My name is Jane'. Prior to our first meeting I travelled to Santi Rama with my partner teacher Ade to meet with the principal and discuss the details of the project. We agreed that the deaf students needed to prepare their stories in advance by writing them down on paper. 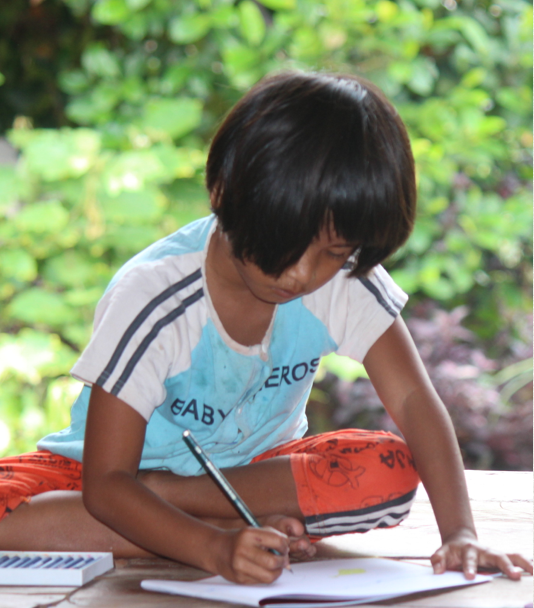 We also asked that each child supply some drawings for the book illustrations. In that first meeting we were able to begin making the story in Keynote. The plan was to create all the layouts in Keynote and then do the final formatting in Book Creator. Out issue is that there is only a small set of iPads at our school and we can only borrow them for a short period of time. 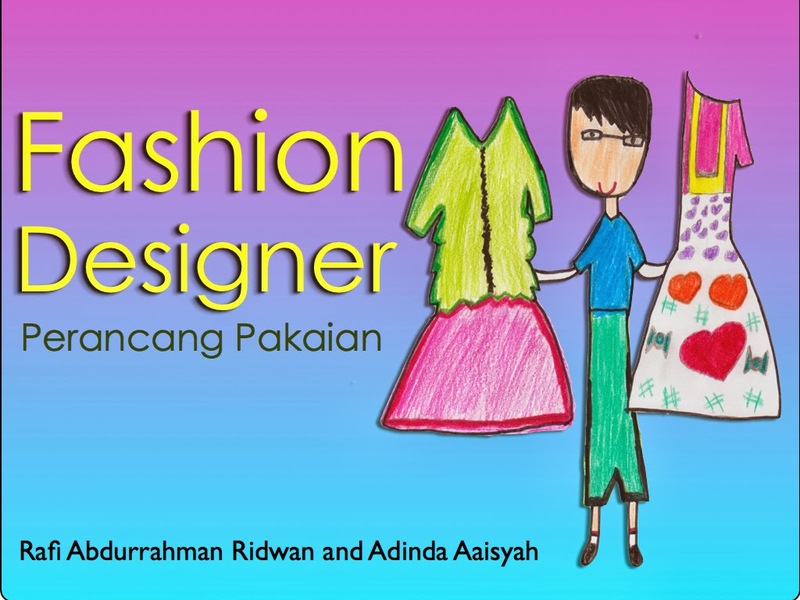 It takes time to create a quality book so I will do the final format for the students in my class. The students will simply export their Keynote pages as JPEGs and I will put the videos and pages together and export them out of Book Creator as an ePUB3 files. In the second meeting the Santi Rama students travelled on our school bus to SWA. They had a great time playing with our students and working on the final video shoot for the sign language. It proved to be challenging for the deaf students to sign each sentence as they were using vocabulary that was not common so they needed extra support from their teachers. This is the first time that they had ever tried to make a digital story book that included sign language videos inside. Take a look at the school Vice Principal supporting this Grade 4 student to do the correct sign language for the sentence, 'Ghina was really happy and thanked God'. 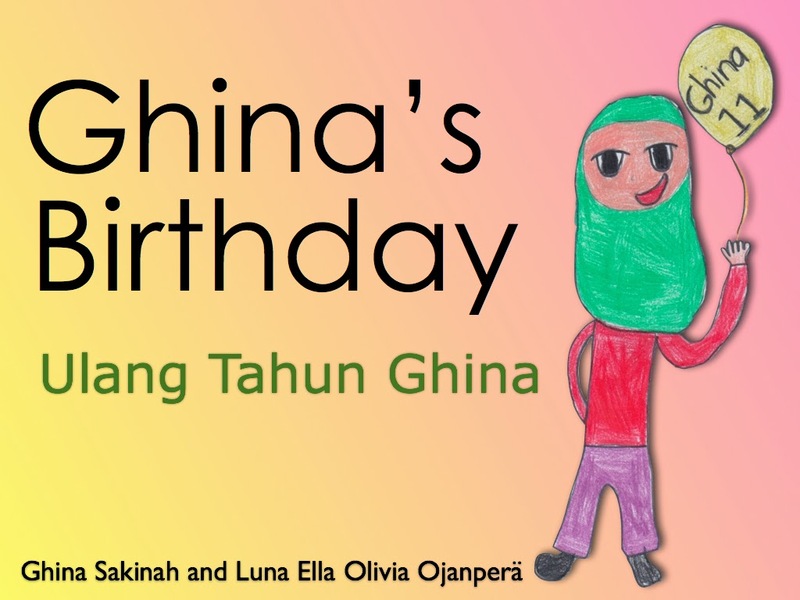 This story is about Ghina herself and how she celebrated her recent 11th birthday. 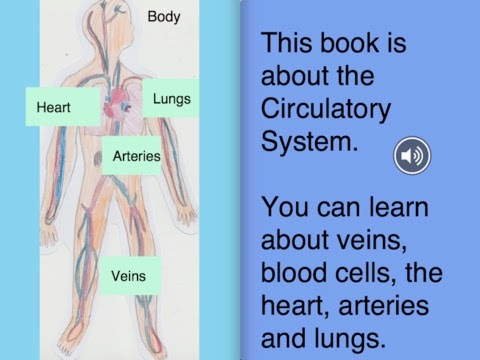 The books are looking quite nice and I am slowly putting the final touches on them in Book Creator. Take a look at these cover designs. My students are currently making Book Trailers in iMovie to promote each book. I can't wait to show you the finished products. It's certainly keeping the teachers; Jocelyn, Ade, Julie and myself all very busy!